Tyson J. Waters, Esq. is Florida Bar Board Certified in Real Estate and is AV Rated by Martindale-Hubbell Peer Review Ratings. Prior to joining Fox McCluskey, Mr. Waters was corporate counsel for Seven Kings Holdings, Inc., a leading real estate management and development company located in Jupiter, Florida. From 2004 through 2011, Mr. Waters was in private practice focusing in the areas of real estate, land use and development law. Before entering private practice, Mr. Waters was an Assistant County Attorney in the Martin County Attorney’s Office. Mr. Waters has extensive experience in handling complex commercial real estate transactions, including the purchase and sale of multi-million dollar properties, the leasing of commercial real estate and all types of residential real estate transactions. He also has handled numerous land use and zoning matters, ranging from site plan approval, land use and zoning changes to variances and other development approvals. 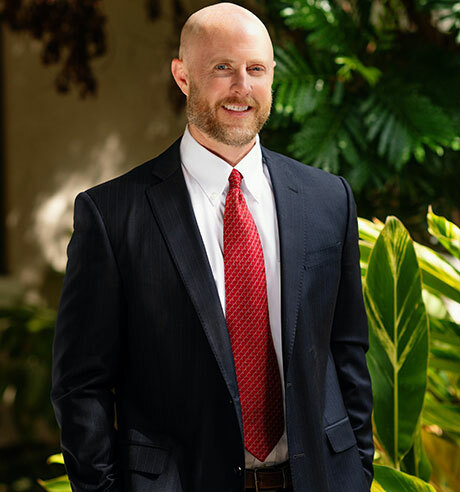 His background in working for a local government, in private practice and as corporate counsel has allowed him to obtain a unique perspective on real estate transactions and issues inherent in the development process. Mr. Waters has lived in Martin County since 2002 and is married with two children. The hiring of a lawyer is an important decision that should not be based solely upon advertising. Please call to set up an appointment for a consultation to effectively evaluate the legal potential of your case. This website has been prepared by Fox McCluskey, for informational purposes only and is not to be considered legal advice. The information contained herein is not intended to create, and the receipt of it does not consititute, a lawyer-client relationship. The above cautionary langauge is for your protection as well as ours.